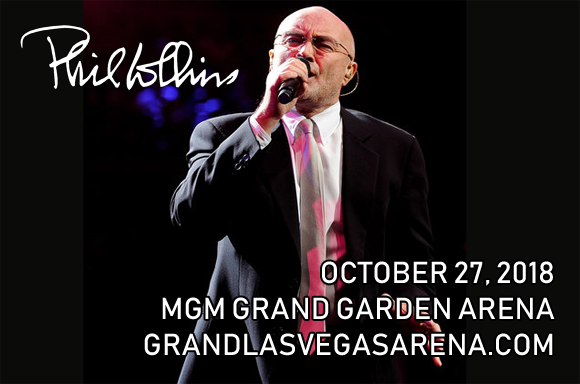 Rock legend Phil Collins comes to MGM Grand Garden Arena on Saturday 27th October 2018 on the Not Dead Yet Tour! A celebration of Collins' prestigious career, the former Genesis star will be performing a plethora of his biggest singles, including "Easy Lover", "In the Air Tonight", "Against All Odds (Take A Look At Me Now)" and more! This iconic performer will be taking fans on a trip down memory lane with a night of wall-to-wall hits – book now to avoid disappointment! One of the world's best-selling artists, Phil Collins is an English drummer, singer-songwriter, record producer and actor. Collins came to prominence in the mid-1970s as the drummer of English rock band Genesis, and later became the band's frontman after the departure of former frontman Peter Gabriel. In 1981, Collins launched his solo career with the album Face Value. He went on to have a hugely successful solo career, launching a multitude of hits, including "In the Air Tonight", "Against All Odds (Take a Look at Me Now)", "One More Night", "Sussudio", "Two Hearts" and "Another Day in Paradise". Through a combination of his solo work, recordings with Genesis and collaborations with other artists, Collins had more US Top 40 singles than any other artist of the 1980s. To date, he has sold over 150 million units worldwide, and he has won eight Grammy Awards, six Brit Awards—winning Best British Male three times—two Golden Globe Awards, one Academy Award, and a Disney Legend Award. He has also been awarded with six Ivor Novello Awards from the British Academy of Songwriters, Composers and Authors, including the International Achievement Award, and has a star on the Hollywood Walk of Fame.